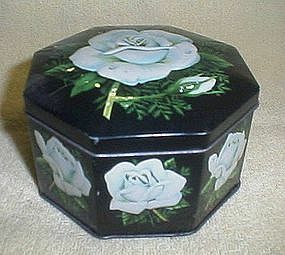 Made in England octagonal hinged tin, white roses and greenery on black background, unsure of age but good condition. 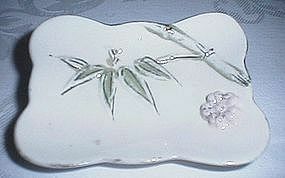 Avon Egg Decanters, on the left is a pale green with butterfly and floral, Charisma cologne. 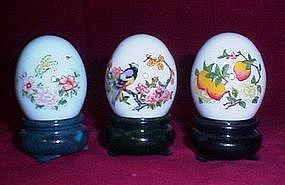 In the middle, a white egg with bird and lotus blossom type floral, empty but held Imperial Gardens cologne, on the right a white egg with peaches and blossoms, Charisma cologne. Buy one or all three! Excellent condition! 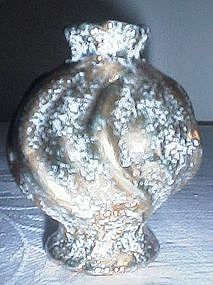 Gold Hand Painted Irice Perfume Bottle, missing the stopper however. 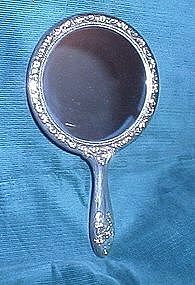 This is a gorgeous silver hand mirror. It is not marked. 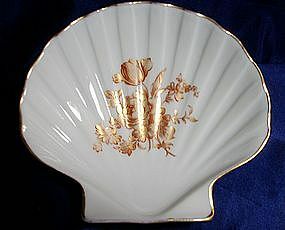 Very good condition, needs polished. mirror is good too. Weighs 1 lb 2.6 oz. Mirror face is 4 1/2 diameter. 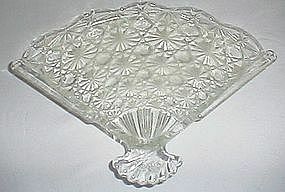 Great for a gift!